The Hipermax GT system allows you to adjust both height and dampening – just as any high quality coilover system should. However, just because HKS is awesome, they give you preconfigured settings out of the box. No preloading of dampers or intial configuration of ride height – they are ready to go once they’re bolted on. This is especially convenient on the 370Z platform. 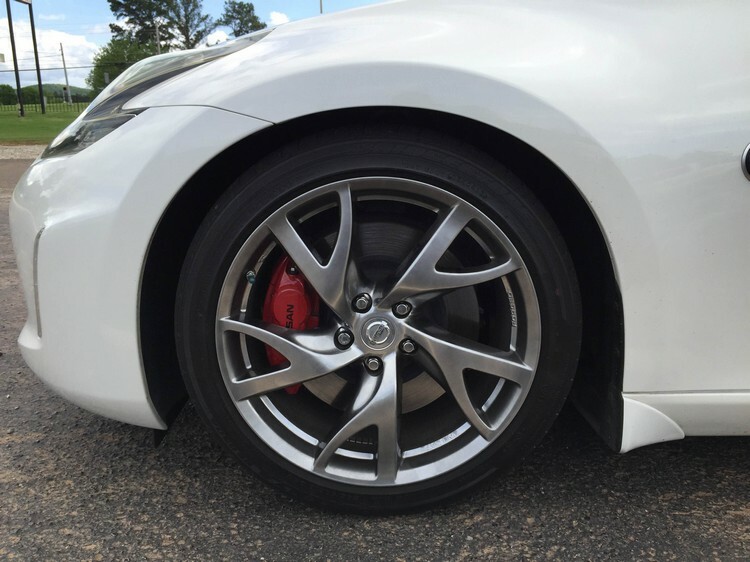 The out-of-the-box settings from HKS for height provide for a stress-free installation on the 370Z. The height drop is 3/4″ all around without any adjustments – just bolt them on and go. I’m a huge fan of this considering the coilovers are aimed at people who use their cars on the street – the height drop isn’t dramatic, but I’ll talk more about that later. 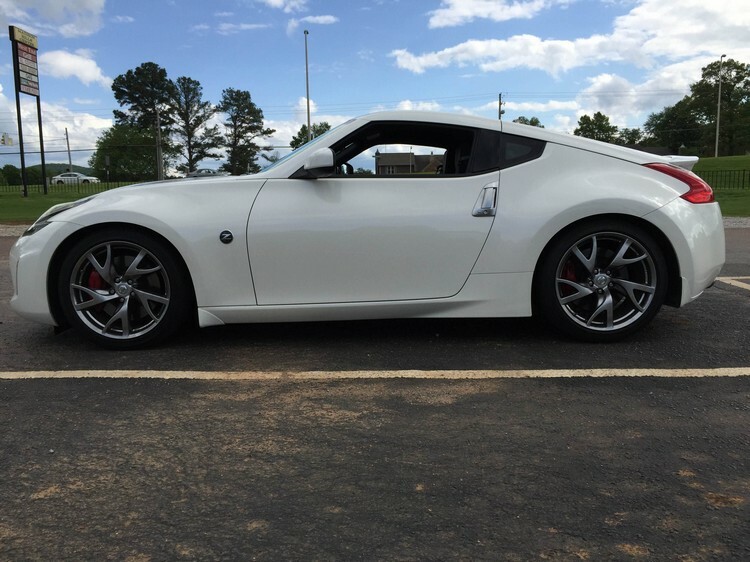 The height reduction also isn’t so extreme to where you need extra parts, but this is due to the design of the 370Z’s suspension. 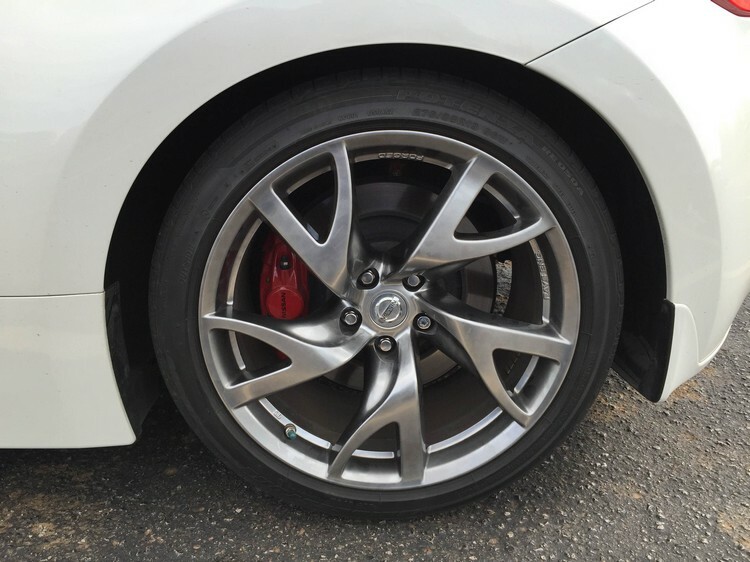 The 370Z requires the addition of aftermarket camber arms and toe bolts (and in some cases, front sway bar end links) to achieve factory spec alignment if you drop the ride height more than an inch. HKS specifies in their instructions that a vehicle alignment is required after installation is complete, however, a successful alignment back to factory spec cannot be accomplished without these extra parts if you deviate from the HKS-supplied settings. The Hipermax system allows you to drop the car as much as 1.3″ in the front and a whopping 2.4″ in the rear (though they advise the bottom end of the driveable range is 1.3″ front and 1.69″ in the rear), so I find their supplied 3/4″ height reduction out of the box to be a fantastic finishing touch to what is supposed to be a streetable suspension system. I didn’t have to adjust a thing. HKS truly nails it here – it’s clear they know the car and its design. In short – these things are absolutely stellar. I expected to feel a difference, but I didn’t expect to be this impressed. As far as the GT version of these coilovers go, they’ve nailed it in every way. They are absolutely streetable. In fact, the default settings actually made my 370Z ride smoother than stock. Smoother. From an aftermarket suspension system? What? The first drive of the car was devoid of any creaks, squeaks, or any other unsettling “break-in” quirks you may expect from such a modification. The car is more civilized over bumps and dips with a tiny increase in the overall stiffness of the car. My drive to work is more enjoyable, so that box is checked. Initially, there was a bit of sway and body roll added, but that seems to have worked itself out after the first day as the car seems to have settled and the dampers have been cycled through their range of motion. The slight drop requires the exercise of caution over questionable inclines and speed bumps, but you’re not handicapped into holding up traffic to pull into the gas station or anything dramatic like that. The drop is tasteful and practical. However, since the dampening is a bit softer than stock, you get a bit more bounce over speed bumps, and any scraping can be avoided by simply taking your time going over them. My alignment guy isn’t available this week, so the next part of this review will come once a good alignment is complete and I can play with the dampening and get a good course run in. I know that they ride perfectly fine for the street, but what I really want to see is how they play when I beat on them. Stay tuned for the next episode, when we push the limits of the HKS Hipermax IV GT Suspension System!